Condos in San Jose for sale. Enjoy a California Condominium Lifestyle. You are here: Home / Condos in San Jose. The California Condominium Lifestyle. Condos in San Jose. The California Condominium Lifestyle. Ready to Start Your Search of Condos in San Jose? Do You Need To Sell Your San Jose Condo? Living in a condominium is not for everyone yet many people prefer the condominium lifestyle. Some people would prefer living in a single family home however they can only afford to purchase a condo. When buying a condo is a buyer’s only option they are at least still afforded the opportunity for home ownership. While they may live with restrictions and rules, in many cases, especially in San Jose and Silicon Valley, condo owners build equity and over time may be able to afford to buy a single family home. For many, it is a better alternative then renting. Many people, including real estate agents, don’t know the difference between a condominium and a townhouse. Many real estate agents list and market a townhouse style condo as a town home when it is legally a condominium. Condo owners are said to own the “air space” within the walls of their condo unit. Owners are responsible for maintaining “walls in”. Owning land is not part of the equation. Generally the condo association is responsible for maintaining “walls out”. Condo ownership is clearly defined in the legal description. Who is responsible for what as well as what condo owners can and cannot do can be found in the CC&R’s and other governing documents. The ‘common areas” within a condo community are jointly owned and shared. Legal descriptions will define ownership of the common area as well. Condo owners are required to pay monthly dues. The dues cover maintenance, management, and reserves. Dues will vary depending on the size of the complex as well as the amenities such as pools, spas, club house, tennis courts, exercise rooms, elevators, etc. Gated, golf and guarded communities tend to have higher premiums. The amenities are among the many considerations in purchasing a condo. One may be paying for amenities they will never use. Condominiums are managed by a management company and have a governing board comprised of home owners who reside within the community. One thing to consider regarding the board members is that they are effectively managing a Corporation. Board members may or may not have any business experience at all and yet they are making decisions on behalf of the entire community. 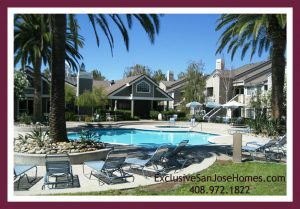 Buyers can choose condos in San Jose with a wide variety of features and benefits. If you are relocating to Silicon Valley, to work for Apple, Alphabet/Google or employers nearby, we highly recommend condos in Willow Glen and Almaden Valley. Let us know what features you are looking for and we’ll prepare a condo list in your price range. Among the desirable features of living in a condo is the fact that homeowners are not responsible for such things as gardening, exterior painting, lighting, replacing the roof, in many cases fixing things like dry rot and remedies for termites. In other words, all the work and maintenance outside the walls of their unit. There are many different condo styles. The one thing they all have in common are Covenants, Conditions & Restrictions, affectionately referred to as “CC&Rs”. The CC&R’s outline what homeowners can, and cannot do. Some condo communities have very strict CC&R’s and others less so. Buyers definitely want to carefully review the CC&R’s before removing contingencies. Need approval of the Board for architectural changes such as replacing windows, adding air conditioning, installation of satellite dish. No hard surface flooring allowed above the first floor. In other words, in upstairs units where another homeowner lives below. Very few condominiums are approved for FHA financing. That is very unfortunate because condos tend to be more affordable for many buyers who only qualify for FHA financing with 3.5% down payment. Lenders have their own lending guidelines they must follow and they must also comply with all other lending guidelines. The most common financing used to purchase a condo in San Jose and Silicon Valley is conventional financing. We do see a fair amount of all cash offers as well. Because so few condo complexes are FHA approved, buyers with FHA financing will save their self a lot of time and frustration if they determine if the complex is approved before looking at condos for sale. The odds are certainly stacked against them. As your real estate broker, we know how to find out which condos in San Jose qualify for FHA financing. We have the best loan officers to talk with to explore other financing options. With so many condos for sale in San Jose, you need the expert help of Kathleen Daniels to locate the perfect complex for your lifestyle. If you have a condo to sell, she understands marketing condos & townhouses as a lifestyle to attract the right buyers. Kathleen services the areas south of the city center including, Blossom Valley, Almaden Valley, Willow Glen, Cambrian Park, Campbell and other Silicon Valley Condominium complexes. Call Kathleen at 408-972-1822 or send her a quick note and she’ll be in contact promptly.